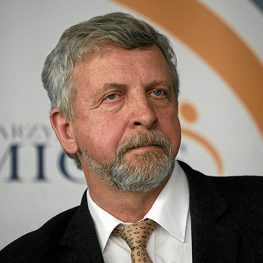 Aleksandr Milinkevich received the "Knight of Freedom" award for his work and commitment to democratic elections in Belarus, as well as for his contribution to the promotion of the freedom, justice and democracy worldwide. In 1969 Aleksandr graduated from the Faculty of Physics and Mathematics of the Grodno State Pedagogical Institute. In 2005 he was appointed as presidential candidate of the Democratic Party, to be able to start on behalf of the party in the 2006 elections. Official results showed that he won only 6% of the votes, thus he didn’t win the election, losing to the Alexander Lukashenko, who received 83% of votes. The election results were deemed fraudulent by many countries and organizations in Europe and around the world, including the OSCE. In response, Aleksandr Milinkevich started a protest against election forgery.